Climate change causes severe weather? 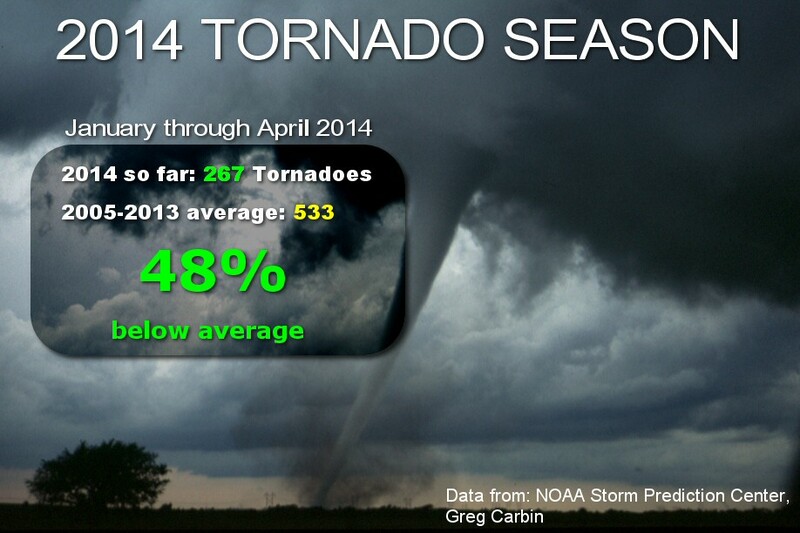 2014 tornado count about half of normal | Watts Up With That? Despite claims of “severe weather is increasing”, and even after several days of tornado activity in the Midwest and the South, 2014 is still below normal compared to recent years according to data published by Greg Carbin of the NOAA Storm Prediction Center. PREL = 2014 PRELIMINARY COUNT FROM ALL NWS LOCAL STORM REPORTS. ACT  = ACTUAL TORNADO COUNT BASED ON NWS STORM DATA SUBMISSIONS. COMPARISONS BETWEEN PRELIMINARY AND ACTUAL COUNTS SHOULD BE AVOIDED. Likely the slowest start to tornado activity in any year in modern record, and possibly nearly a century! It got busy very fast though. 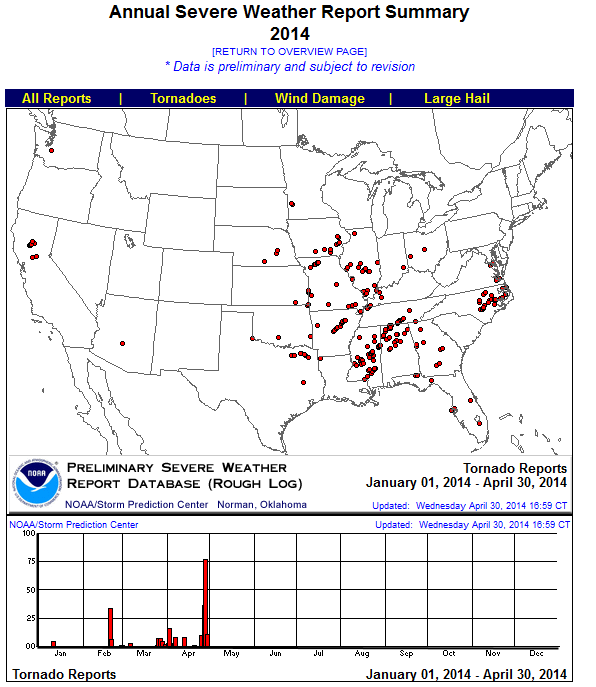 There were only 20 tornadoes up to April 20th, then 93 tornadoes in storm reports up to April 24th, but then SPC recorded 87 tornadoes in storm reports alone on Monday April 28th, many with fatalities (preliminary data, and may be subject to revision once investigations are made on storm events). I find it interesting to note that he past three seasons have all been well below the 2011 tornado season, which had the second highest tornado count on record and was much ballyhooed by climate alarmists as the defining link between severe weather and climate. 2012, 2013, and 2014 so far seems to be an inconvenient anomaly for those claims. Another claim was that the flooding in Pensacola, FL, which got over 29″ of rain, setting a new record, was related to climate change. OBSERVING SYSTEM AT PNS ON THE EVENING OF 04/29. At one point Tuesday, Pensacola received 3.39 inches of rain — in 27 minutes! They were up to 3.95 inches in 34 minutes, 5.68 inches in 1 hour and 15.55″ in 24 hours! Actually, the 15.55 is an estimate as their automated rain gauge failed amidst the deluge. A separate weather station nearby recorded 17.7 inches, while other estimates in the area were as high as 22 inches. With rainfall rates like that, street flooding is no surprise. @EricHolthaus attributing flooding In one county to global temperature rise is beyond our scientific capabilities. It is element of faith. But, look at this table, and note when the events occurred – well before our current spate of worry about “climate change”. May 2, 2014 in extreme weather, tornadoes. So a temperature increase you can’t even see on a thermometer is supposed to cause all this……. 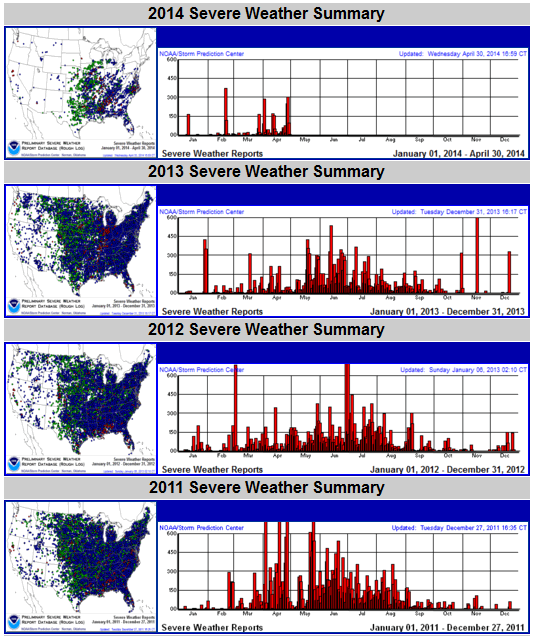 Will the colder winter essentially mean that the Spring tornado season will go later this year in the US? A later start and later finish? We must be approaching the time when alarmists will routinely claim that ‘climate change’ is causing more meteorite strikes. What’s that? A little red dot in Phoenix Arizona? OMG its worse that we thought! I had to look it up and sure enough a small tornado was reported in March. The NWS gave the tornado a preliminary rating of EF-0, meaning it had winds of 65 to 85 mph. The weather service said the tornado was about 10 to 20 feet wide and touched down in a nearby park before skipping through the apartment complex. “Several residents reported seeing the tornado and a flying hot tub.” Yes, really. Fortunately no one was in it at the time. We do get microbursts here occasionally during our “Monsoon” season, but tornadoes are quite rare. One thing to keep in mind, some of these old rain rate records are likely erroneous. For example, I’m rather skeptical of the 1-min rain rate record. If you go back to the original report in Monthly Weather Review (http://docs.lib.noaa.gov/rescue/mwr/087/mwr-087-08-0303.pdf), you can read that this amount fell “in an estimated period of 1 minute”. Still, extreme rainfall is probably only ever-so-slightly more likely now than in the planet’s barely colder past. You should not have said this could be the mildest tornado season in a long time. Mother Nature does not like to be challenged. Kinda like washing your car during a dry spell. I find it so funny that we are now reduced to arguing about the weather. I only state this because when there was clear global warming Warmists did not want to talk about the weather. Now, even daily heavy snowfalls, cold, rain, a hot day, locust swarm, high tides, 1 month drought etc. 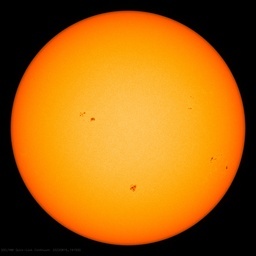 are sure signs of global warming climate change. This can go on forever!!! And it’s all our fault. I wonder why the Alarmists thought that they would do better with “extreme weather” than with “global warming?” Anyone? Maybe they thought any change of subject would be helpful to them. 1.23″ in one minute! That is impressive! It must have been coming down like rifle bullets! How do we arrive at 48% with those two numbers? Looks almost dead-on to 50%, like 49.9. A reason? Yet again WUWT adopting adopting the warmist’s concept of “normal” weather which WUWT has been decrying for years. So why is 2005-2013 , a rediculously short period, considered to be “normal”. Why is this the cherry-picked “average” the new period of reference for 62 years of data ? This recent peroid itself has been very low activity, it is hardly the norm against which everything can be measured. Theo: I wonder why the Alarmists thought that they would do better with “extreme weather” than with “global warming?” Anyone? Because it’s a non falsifiable claim (they learnt that lesson with global warming), and there’s always some extreme somewhere on the planet that they can latch onto to spin the myth. The fact that a non falsifiable claim has no scientific value ( anti-science as they would say ) does not worry them because the crowd of idiots they are preaching to do not understand science. When there are no more extreme weather events anywhere on the planet we can start worrying about a fundamental change in climate. They want to regards that as “normal”. Anthony, Please could we stop using the political term ‘climate change’. They mean global warming so let’s use it. When some time soon, when skeptic science predominates and people look at the evidence and not the “consensus science” view of eco-politicised academics, I suspect this reduction in Tornado activity may be cited as the first real sign of the effect of rising CO2. And it will be noteworthy that the first people to highlight it were the skeptics. 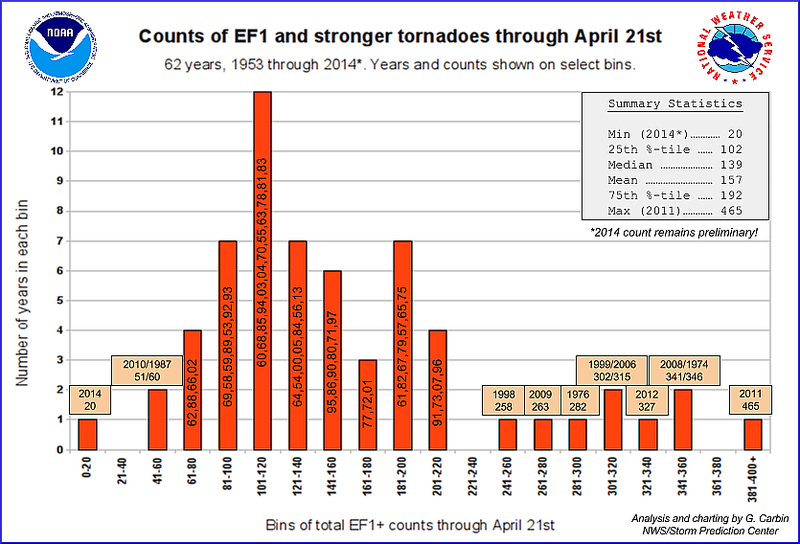 2014 tornado counts are so low that it broke the previous record for the first F3 tornado (Mar 31) by a whopping 26 days. Even more remarkable is that these low nominal counts are *before* you adjust for increased population and better tracking technology. Wouldn’t take long for everyone to be alarmed by a coming little iceage. “This year is maybe a record-breaking year,” says expert on Great Lakes ice. As of May 1st, ships were still being escorted with ice breakers on Lake Superior, says the Duluth News Tribune. There is more but got bored. Why would you want to buy a house in somewhere called “Tornado Alley” anyway. They may once have been the “mainstream” media, but now the “mainstream” is the internet and social media. Indeed, with advertisers leaving them in droves, with online news content taking over and with high quality skeptic science sites like WattsUpWithThat now taking over in areas like Climate, one can hardly describe these press-release sausage machine, “10 stories a day per ‘journalist’ and little or no fact checking as “mainstream” – I now call them the “Dinosaur News Media” because many are heading toward extinction. A sad and contrived term, the only use for which is to distinguish its subject from “reporter”, whom we imagine as actually pursuing facts. I think localized areas near Charlottesville, VA on the Blue Ridge got an estimated 30″ rain over ~8 hrs from the remnants of Hurricane Camille in August 1969. No “official” raingauge, but estimated by the VA weather service from numerous open barrels and buckets in the area. Whole mountainsides, forest & all, slid down into valleys. @beng – Nelson county. Which is merely a valley between 2 mountains to begin with. 128 deaths in a county with a total population of about 5000. Huh. Just finished reading that corn yields are affected by hot and dry weather while noting that corn yields are up. Now I find that tornadoes are increased by global warming and tornadoes are down. I’m starting to approach 99% confidence that their predictions are 100% crap. Much play is made of the under-counting earlier in the record in an attempt to dismiss the whole record as unreliable. After all if the data shows vastly more tornadoes in the 70s at the coolest part and much less in the 2000s when it was considerably warmer, well the data MUST be wrong. It must need some “bias adjustment” or better still it should be thrown out all together. Not much adjusting to do if stick to EF2 and greater. World political leaders say that “Climate Change is real, it is happening now.” Since climate is defined as normal, or typical weather (usually over a 30 year period), what are the changes in the climate we can observe? In the past, there have been periods where on balance temperatures have risen, and periods of cooling. The present climate situation is a global temperature plateau following a period of warming. It is uncertain how long the flat trend will continue, and whether it will end with warming or cooling. It has been at least this warm in the Medieval period, certainly warmer in the preceding Roman and Minoan periods, and those temperatures were a boon for human civilization. The average temperature since 1900 has been increasing. However, that average increase was due to warmer shorter winters with no increase in summer temperatures. In fact, the hotter summer temperatures have dropped. The average mean yearly temperature is highly correlated to the number of days a year is above 30C (hot days), the number of days in a year the temperature is below –20C (very cold days) and the length of winter in days. All three of these are decreasing, meaning more moderated yearly climate today as compared to the period before 1950. What is actually, physically happening is a narrowing of the variability in temperatures with no net change in summer temperatures, except that there are fewer hotter days. This narrowing in variability is primarily due to warmer shorter winters. If this trend continues, the future of the planet is not one of warmer, harsher climate, but less variability in yearly temperatures below a summer normal that is not increasing, more tolerable winters, longer growing seasons, and lower heating bills. Rainfall patterns are such that presently 33% of the land is considered desert, defined as places where evaporation exceeds precipitation. Satellite images show that desert areas are turning greener in recent years. During the recent warm decades extreme weather has not increased by any statistical measure. On shorter time scales (60-year cycles), the warm phases of AMO cycles correlate with extreme storms, but ocean circulation is not driven by air temperature or CO2. On longer time frames, Eg. comparing the Medieval warm period with the Little Ice age, it is clear that cooler periods have more extreme weather, not less. The long-term intense hurricane drought means that a mere “regression to the mean” will see more hurricane landfalls and considerably higher damage in the years to come. A return to the “old normal” of, for example the 1950s-, would mean both hurricane damage and storms would increase dramatically in the years to come. The most careful empirical studies show that, so far at least, there has been no perceptible increase, globally, in either the number or the severity of extreme weather events. These studies also show that, thanks to scientific and material progress, there has been a massive reduction, worldwide, in deaths from extreme weather events. It’s beautiful in so many places, check it out. Couple of examples… Come by Tennessee and The Grand ‘ol Opera House or the country & western shows Branson, Missouri and visit. You might not ever want to leave. And on deck is the next polar low coming ashore in the west. The dry line is already forming across Utah, Wyoming, Idaho, and the Dakotas… By mid week it should be over the central plains..
And many of those western states will have snow above 6 thousand feet… Winter is trying like heck to hold on for one last blast.. This information, cited by Greg Carbon is flat wrong. Just in the last days of April 2014, the 26th, 27th, and 28th, there were over 200 tornadoes, and Mort than 30 related tornado deaths. The overall total tornado count is above average for annual April tornado statistics in 2014, and the tornado death rate for April 2014 is significantly higher than most other April’s on record with one exception, April of 2011. This is entirely inaccurate reporting of weather statistics!